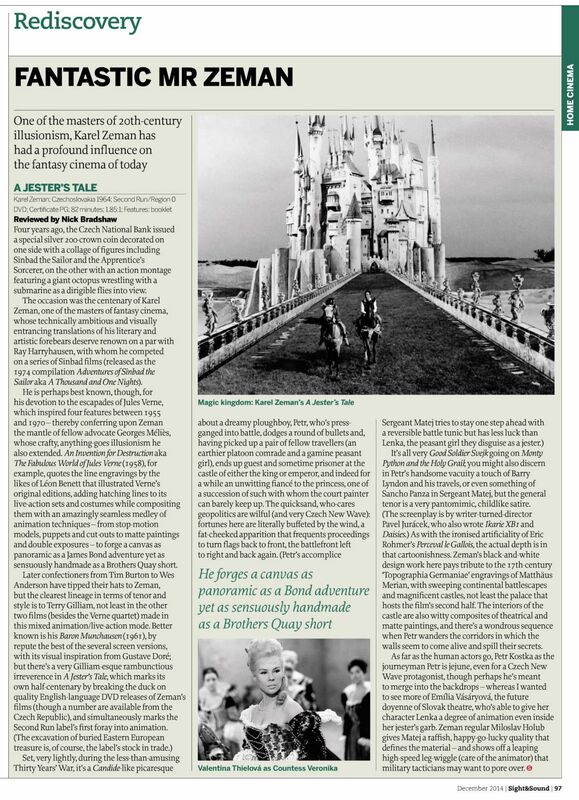 "Forges a canvas as broad as a Bond adventure yet as sensuously handmade as a Brothers Quay short"
Delighted!! Our release of Karel Zeman's brilliant A JESTER'S TALE (Bláznova kronika) has just won the 'Best Rediscovery on DVD' Award at Bologna's prestigiousIl Cinema Ritrovato Festival!! I loved this film. Story-wise, it's completely banal, but visually it's a constant delight that had me laughing and grinning. Great work, as usual, Second Run. This was the first Second Run release I got (I think after reading Glenn Kenny's blog post about it) and I loved it as well. I'm really hoping for more of his features and shorts to be released, especially The Treasure of Bird Island and Sinbad because of their Persian miniature art style.